Now it was time to leave HCM again for the 3-hour drive to the fishing town & beach resort of Phan Thiet. We checked into the fabulous Victoria resort in Cape Mui Ne. This area is known for its 21 kilometre long arc of fine sand. The stylish &elegant Victoria resort offers the very best individual bungalows set in gardens of tropical trees within a few steps of the fine sandy beach. The swimming pool is beautifully blended in with the lovely gardens & the sand & sea, relaxing & elegant. The restaurant is artistically decorated in a modern Vietnamese style and serves excellent food. The mixed raw fish in coconut milk starter & the baked fish in wine & garlic sauce as a main course were both superb. Breakfast outside on the restaurant balcony overlooking the beach & the sea is simply luxurious. 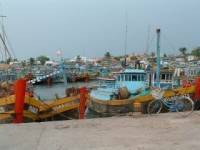 Apart from the beach & the sea, Phan Thiet is also a fishing town. There are fleets of fishing boats by the main bridge in the centre as well as the fish market. It makes a good postcard photo. Don't miss eating seafood in Phan Thiet as there are plentiful nice restaurants. The 'shrimp' Kim Anh Quan restaurant in the centre of Phan Thiet town turned out to be more like a small lobster and must have weighed about a half a kilo each. Two giant prawns like that cost less than £3 total, just marvellous. Next day we checked into the Bamboo Village. 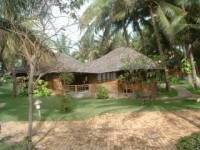 Although much less grand than the Victoria Resort, the Bamboo village has a much more laid-back style, octagonal bamboo bungalows set among the gardens, again right next to the beach on the same stretch of coastline at Mui Ne. All too soon our break on the beach was over, and it was time to drive back to HCM to check into the 5* Sofitel Plaza. A top-notch and beautiful luxury hotel, the Sofitel has a rooftop swimming pool and is located on historical Le Duan Boulevard, right next to the British and US Consulates. Don't miss their lunch or dinner buffets, both lavish & delicious.